RACHEL MASON: White Oracle, 2014. GEO WYETH, Kitchen Steve, 2014. MARIA HUPFIELD: Ghost Trophy, 2014. RYDER COOLEY AND ALAN SPARTACUS: Owl Spell, 2014. INSTITUTE FOR NEW FEELING: Site specific installation, 2014. BAKER OVERSTREET: artifacts from performance, 2014. 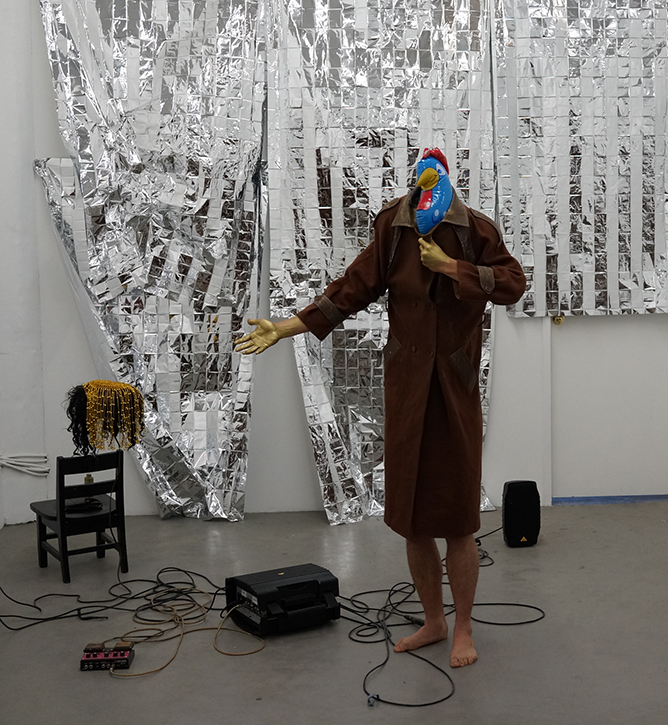 GEO WYETH: artifacts from performance (Gold headpiece, golden knife and plastic chicken), 2014. 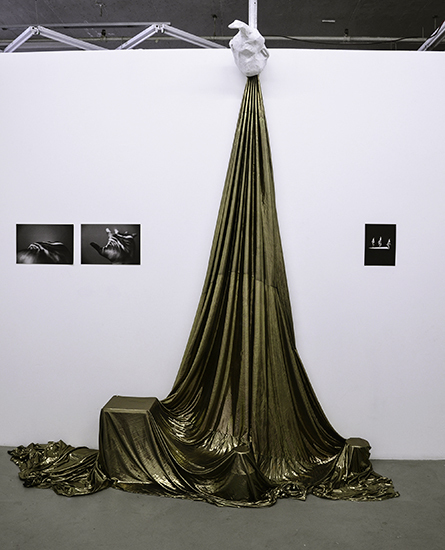 RACHEL MASON: artifacts from performance (Gold spandex, papier mache headpiece, 2 x 11x14" photographs, 8.5 x 11 collage) , 2014. RYDER COOLEY: Artifacts (ashes, owl wing), 2014. 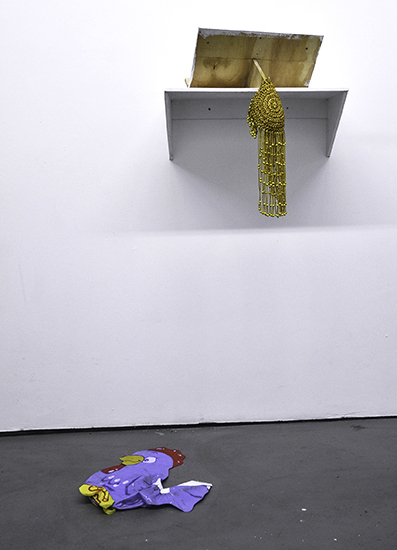 MARIA HUPFIELD: Artifact (Blond braid, piano stool and circle of felt), 2014. MICHAEL DUDECK: Messiah 1.0, 2014. BLANKO + NOIRY: Collaboration with Baker Overstreet, 2014. Ortega y Gasset Projects is pleased to present Body as Omen, an exhibition organized by Sheilah Wilson, featuring new performances by Ryder Cooley, Michael Dudeck, Blanko + Noiry, Maria Hupfield, Rachel Mason, Baker Overstreet, Geo Wyeth and the Institute for New Feeling. Body as Omen explores the possibility of body as portal between environments and altered states of being. Body as Omen acknowledges the multiple ways in which the body can be articulated as a proposal. Each artist addresses the intertwining of both transcendence and unequivocal placement within the body. Perhaps the belief that there is some way of creating a vessel within the vessel is absurd, doomed to fail. Or perhaps there is no gesture that holds vulnerability and agency together as clearly as the body performing. Body as Omen proposes the articulation of present tense desiring future, but always existing as the moment that has been ­­ a hinge between performance, body and desire. We know our ships are riddled with holes. Artists will be creating a new work that investigates the potential of invocation, reversal, and channeling as as tactics towards transcendence of a body reveling in the fact that it is trapped within itself. Ryder Cooley examines human­animal relations, hybridity and extinction. Her recent collaborations have been with a disembodied taxidermy sheep, named Hazel. She will be collaborating with Allan Joseph and Spartacus for an Owl Spell. Maria Hupfield locates the body as a site of resistance and agency through the use of actions, objects and images. Her new project, Ghost Trophy, comprises video projection (by Maria Hupfield & Jason Lujan) and live performance. She activates the space of a lavish historical interior using handmade items, one of which is a vest featuring crystals recovered from a chandelier. Rachel Mason uses voice and songwriting as tools to mold worlds around herself. She inhabits various alter­ego personalities, including: FutureClown, an internet­based clown who attempts to span both physical and virtual space simultaneously, The Terrestrial Being, a starseed trapped inside of a motorcycle helmet who performs superhuman feats, and The White Oracle, who performs rituals from lost ancient civilizations. Mason will be performing the character of the White Oracle while simultaneously creating a live soundtrack. Baker Overstreet revisits his character “June” and how the character’s physicality interferes with sets and props of his own making. In a self proclaimed “trunkshow” Overstreet employs, and sometimes reacts against, our preconceived ideas of archetypes ­­ such as the prankster, the magician, the Broadway belter, and the tramp, asking the viewer to question the difference between laughing at and laughing with a performer. Frank Haines will be performing as Blanko+Noiry, with Reuben Lorch­Miller and Chris Kachulis. Blanko + Noiry is a multi­generational performance collaborative that has been performing in New York City since 2007. These performances are based on mutual interests in ritual, vaudeville, show tunes, psychodrama, Viennese Actionists and experimental electronicmusic. Geo Wyeth performs spontaneous response to situation, often incorporating DIY instruments and an irreverent theatricality of struggle. Michael Dudeck creates mythological, religious fictions and animates them through ritual mediatic performance. Transforming the gallery into a temporary cyborg temple, he will mummify a fictive prophet in durational ceremony, quite literally trapping the body within itself. Binding the body/figure shape shifts subject into object, exposing/exploring ancient themes of idolatry while constructing a new, queer iconography. A performance by The Institute for New Feeling will follow the series, wherein they will initiate a new research study­­an interactive installation that engages bodies moving through the gallery. Invocations and reversals will be performed over a period of three days. Objects from the performances will be catalogued and displayed. A publication will accompany the show. RACHEL MASON: Performance artifact (detail), 2014. 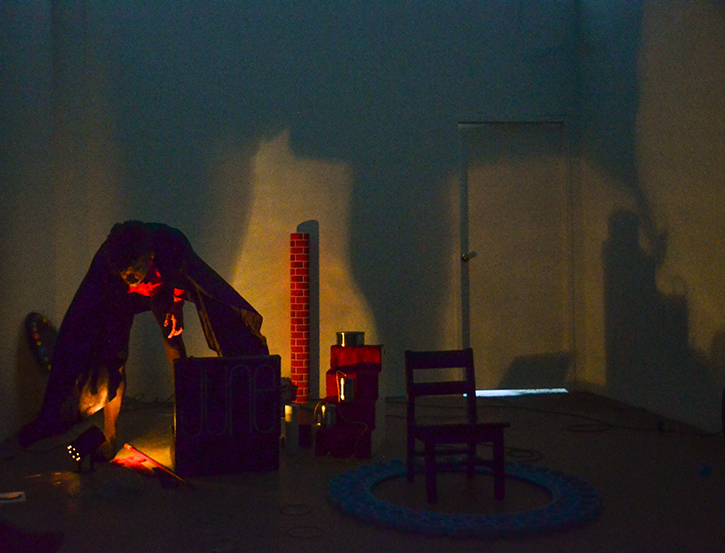 MARIA HUPFIELD: Artifact from performance (video still), 2014. Ryder Cooley has participated in a wide range of public works, educational projects and international shows. Selected works have been presented at locations including: Proctors Mainstage in Schenectady NY, Le Petit Versailles and Dixon Place in NYC, MASS Art in Boston, Governors Island, White Box and Exit Art galleries in NYC, Yerba Buena Center and Theater Artaud in San Francisco, El Visio Theater in Mexico City, the Robert Wilson Watermill Center in Long Island, Pan American Art in Miami, and public art projects in Indonesia, El Salvador, France and the Czech Republic. Ryder completed an MFA in Integrated Electronic Arts at Rensselear Polytechnic, an MA in Combined Media at SUNY Albany, and a BFA in Sculpture at RISD. She is currently based in Hudson, NY, where she lives and works at an animal rescue center. Michael Dudeck is an artist and cultural engineer who decodes dominant cultural myths and re­codes them into contemporary fictions. His work is separated into three streams : The Religion Virus (an invented queer religion and prehistory), Punc Arkæology (a pedagogical/curatorial methodology) and The Museum of Artificial Histories (a fictive institution housing artifacts and alternate information systems.) Over the past year, he has undergone a Museological Pilgrimage through Europe with funding from the Brucebo Foundation (Sweden), lectured/performed at Witte de With CCA (Rotterdam, NL) The Insel Hombroich (Neuss, Germany), The Brucebo Museum (Visby, Sweden), Peformatorium Festival for Queer Performance (Regina, Saskatchewan), Asylum Arts (Garrison, NY) and The Glasshouse, Union Theological Seminary and Freeman Space in New York City. He is artist in residence at Union Theological Seminary in New York, per formatively inhabiting a space of queer holy office in contemporary culture. He lives and works in Winnipeg and New York. Maria Hupfield is based in Brooklyn and a member of Wasauksing First Nation, Ontario Canada. A 2014 recipient of the Joan Mitchell Foundation Painting and Sculpture Grant and the AIM residency at the Bronx Museum, Hupfield’s performances use handmade objects that are carried on the body. Her work “Contain That Force: 7 Solo Acts” was presented by the National Gallery of Canada for the exhibition “Sakahan: International Indigenous Art”, with SAW Video and Media Arts, Ottawa Canada. She performed “All is Moving” in response to the paintings of Artist Jaune Quick­to­See Smith at Accola Griefen Gallery, Chelsea NY and participated in A Conversation on Performance Art: Women Redrawing/Performance, organized by The Feminist Art Project at SOHO20 Chelsea NY. Hupfield has shown at the Museum of Arts and Design New York, Toronto Power Plant, and 7a*11d International Performance Festival Toronto Ontario. Artist and Magician, Frank Haines, currently lives and works in Brooklyn, New York. Haines has performed at Santos Party House (NYC), Pyramid Club (NYC), Basso, (Berlin), and the deep woods of Delhi, NY. His most recent collaboration was this Fall with Zeena Schreck for Performa 13. Additionally, Haines is part of the cross­generational performance trio of Blanko & Noiry. 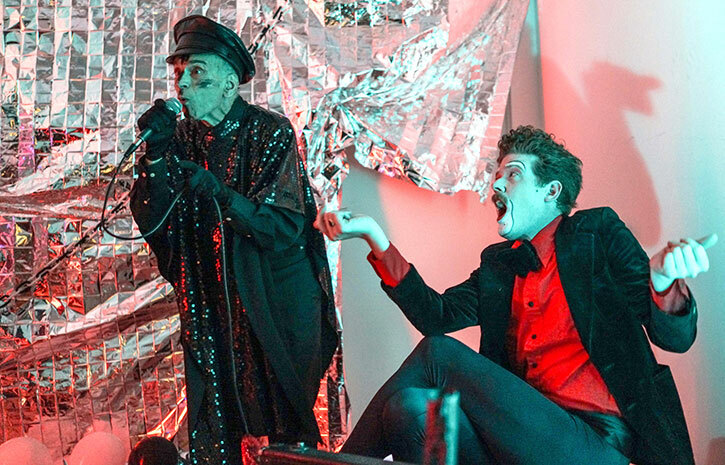 Notably, they performed at a night he curated titled Blood Transfusion for a Ghost at PS1/MOMA in conjunction with their Kenneth Anger exhibition. Haines has exhibited extensively in the US and Europe at BFI (Miami), Jackie Klempay Gallery (Brooklyn), AMP (Athens), Boston University Art Gallery, Jack Hanley Gallery (San Francisco), Lisa Cooley Gallery (NYC), Krinzinger Gallerie (Vienna), ZDB (Lisbon).Additionally, Haines is working on a book of interviews with 25 fellow artists and scholars, curating the upcoming exhibition Witch Favors, and collaborating with Jerry (The Marble Faun) Torre. Rachel Mason is a sculptor, songwriter and performer. A graduate of UCLA and Yale University, she has written three operas, recorded ten full length albums of songs, and has toured, screened films, exhibited sculpture, video and performance at galleries and museums internationally. She is represented by envoy enterprises. She has exhibited and performed at the Queens Museum, Detroit Museum of Contemporary Art, School of the Art Institute in Chicago, Henry Gallery in Seattle, James Gallery at CUNY, University Art Museum in Buffalo, Sculpture Center, Hessel Museum of Art at Bard and Occidental College, Kunsthalle Zurich, Museum of Contemporary Art Detroit, The New Museum, Park Avenue Armory, Art in General, La Mama, Galapagos, Dixon Place, Human Resources, Clocktower gallery and Empac Center for Performance in Troy. Baker Overstreet was born in Augusta, Georgia. He went on to receive his BFA at The Maryland Institute of Art and his MFA at Yale. He now lives and works in New York,NY. Primarily a painter, his abstract works play with symmetry and pattern in an effort to address the associative elements of his work. Oftentimes referencing architectural and figurative at the same time, his picture planes straddle the area between flat and spatial, masquerading as a type of optical illusion. While playfully humorous in their approach, they allude to a darker, perverse ideology. Similarly, his performance work takes on ideas of “entertainment” and “showbiz” and the conflicts these terms face in a performance art forum. Performing as “June”, his stage persona, he creates crudely assembled stage pieces that both dazzle and fail in their attempt to recreate the ambiance of The Great White Way or The Big Top. June’s song­and­dance routine in and around these sets reinforce this duality, creating a fantasy world that is clumsy yet finessed, charming yet alarming. Geo Wyeth is an artist and musician. His work has been included in exhibitions and performances at The Studio Museum in Harlem, PS1 MoMA, Joe’s Pub, Danspace at St. Mark’s Church, The New Museum, Kate Werble Gallery, Human Resources, Joe’s Pub, La MaMa ETC, SF MoMA, his apartment, etc. He has received funding from the Jerome Foundation and Art Matters. He is a two time Yaddo fellow. He was born in New York City in 1984 and raised in Hell’s Kitchen and Montclair, New Jersey. Institute for New Feeling is a collaborative research clinic committed to the development of new ways of feeling and ways of feeling new. IfNf currently exists as a migrant performance series led by core members Scott Andrew, Agnes Bolt and Nina Sarnelle, developing treatments and retreats for individuals and groups. The members of IfNf have collectively presented work at Thank You for Coming, Los Angeles; Pittsburgh Filmmakers, Warhol Museum of Art, VIA Festival, Pittsburgh; Space Gallery, Portland, Maine; Kijidome, Boston; The Atlanta Contemporary Art Center; Open Engagement Conference, Queens Museum of Art, NY; Invisible Dog, Microscope Gallery, Brooklyn, Monkeytown4, Denver, Museum of Contemporary Photography, Chicago, among others. Upcoming projects include the The Pittsburgh Biennial, Cannonball Residency and commissioned project at Untitled Fair, Miami; and a residency at the Atlantic Center for the Arts. Sheilah Wilson is an artist currently living in Granville, Ohio and River John, Nova Scotia. She received her BFA from NSCAD and MFA from Goldsmiths College. Using photography, performance and thought transmission, her work charts a language that is unrestrained by fact or historical accuracy. Recent solo shows have been at Enjoy Gallery (Wellington, New Zealand) and Antioch College, Ohio.